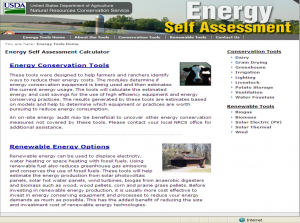 The Energy Self-Assessment tool has been taken off-line because it has an error and unfortunately the USDA-NRCS has not able to fund maintenance on the website. We are looking for funding sources to get it back online but at this time we have not secured funding. If you are willing to provide tax deductible funding to the University of Wisconsin for the maintenance of this website, please contact Scott Sanford at sasanford@wisc.edu. We need to know more about who is using this website and what tools you are using. Please take less than 5 minutes to give us feedback that we’ll help us make the case for getting this site back on line.